The first thing I saw was Doctor Doom on the cover, and I WAS READY! Dr. Doom has always been the epitome of “the Marvel Villain” to me, alongside Magneto and Thanos, so I was very excited going into this issue. The cover was probably a little misleading to people originally, as it seems to make Doom appear to be a giant behind a plate of glass. Contrary to this, he’s actually just your typical human height – and I bet people were a little disappointed once they found out. To make matters worse, the first page features a towering Dr. Doom with miniature statues of the Fantastic Four, which again makes him look like some sort of puppet master or something. One funny thing that tends to pop up from time to time are moments where Johnny is reading comic books. In the last issue, prior to meeting Namor, he’s actually reading a comic with Namor on the cover. This time he’s caught reading a Hulk comic book (nice cross-advertising, since the Hulk had only just come out). Hilarity ensues when he compares The Thing to The Hulk (and to think that they all eventually meet!). Also on the cover, notice that off to the side is the helpless Invisible Woman. Too often does she play the damsel in distress, and it has gotten old already (only five issues in!). In this issue, she willingly becomes Doom’s hostage, which makes the remaining three members of the Fantastic Four succumb to his demands. And what are his demands? This is where the story took an unexpected turn. 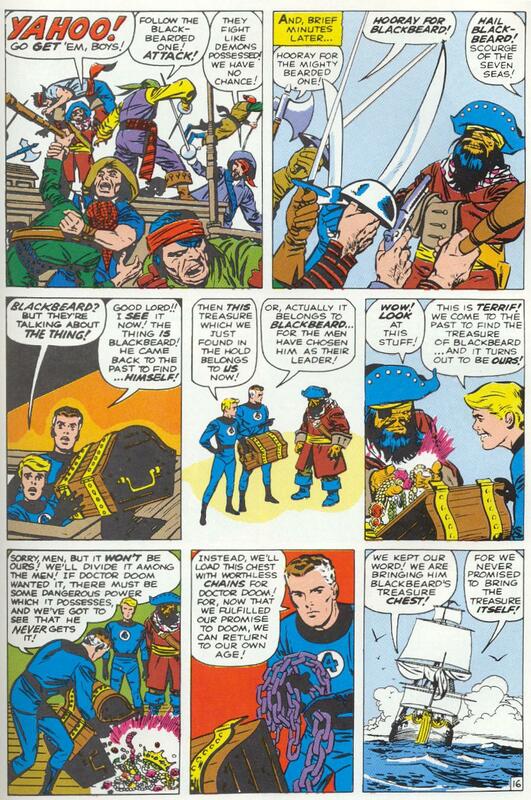 Doctor Doom is after a treasure chest held by the infamous pirate Blackbeard. The chest contains jewels enchanted years earlier by Merlin the wizard. Doom desires these riches (for whatever power they may bring him), and is ready to send Mr. Fantastic, the Thing, and the Human Torch BACK IN TIME to fetch the chest. Dr. Doom gives them only 48 hours to accomplish this task, and being a man of his word, will set them all free once it is safely delivered to him. The team arrives and decide they need to steal some pirate clothes in order to blend in. This campy romp was very much like one of those Star Trek episodes where they end up in Colonial America or something and have to wear disguises to fit in with the time period. It’s a little silly. The Thing looks especially ridiculous, with an eye patch and black beard to boot. The Fantastic Three eventually end up on a pirate ship, where they come under attack from another ship. The Thing leads the charge, and after the battle ends in success, the crew chant “Hooray for the mighty bearded one! Hooray for Blackbeard!” This was a pretty cool twist – there WAS no Blackbeard until the Thing showed up and now HE is Blackbeard. Sometimes time travel stories are fun! Mr. Fantastic and Johnny find the treasure chest, and decide to give it’s contents to the rest of the pirate crew. They agreed that if it must hold some sort of power in order for Doctor Doom to want it so badly. Besides, Doom specified that he wanted the treasure chest. 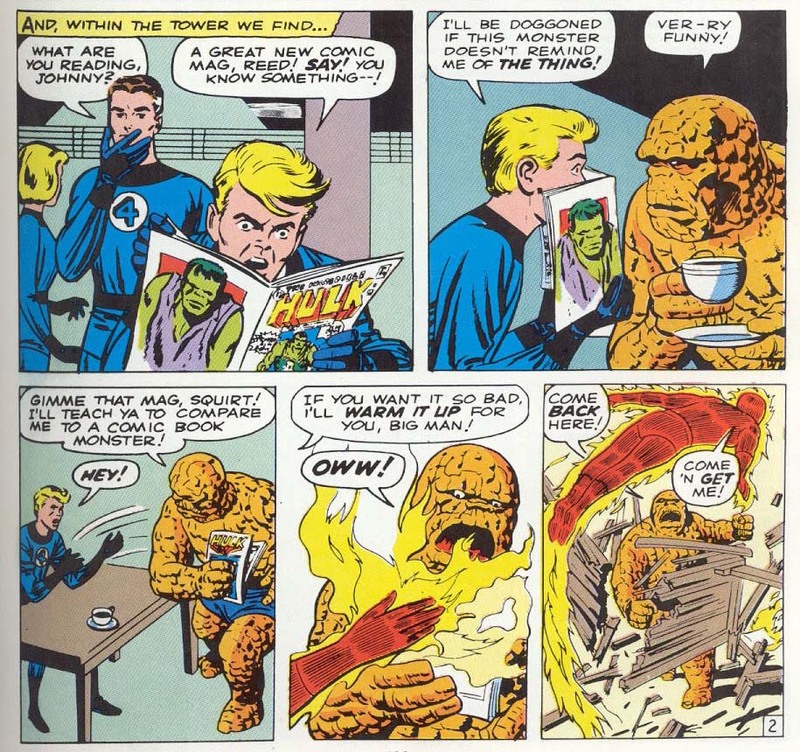 Meanwhile, knowing that he is Blackbeard and captain of a crew that loves him, the Thing takes a turn for the worst and unexpectedly tries to kill his friends. I can understand the wanting to feel needed and excepted, but I still don’t understand why he almost killed his friends over it. Strangely, fate delivers a whirlwind upon the ship at that very moment, causing the three of them to get washed to shore. Doctor Doom soon beams them back, discovering that the chest only contains chains. Then we finally enter the scenario depicted on the cover, where they’re all trapped in a room without oxygen. 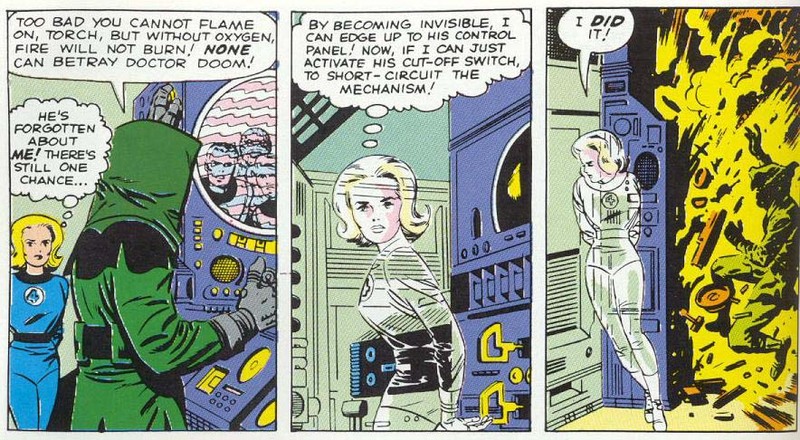 Susan turns invisible, and actually saves the day (for once) when she pretty much BLOWS DOCTOR DOOM TO HELL by short-circuiting his computer console. The team escapes, setting fire to Doctor Doom’s castle. Dr. Doom has his own getaway plan though – a jetpack, which he uses to escape. As for Doctor Doom, he was a little different than I imagined. He was less menacing and more along the lines of being creepy. He’s slightly hunched over and gangly looking appearance doesn’t carry the presence that I’ve come to expect from him over the years. 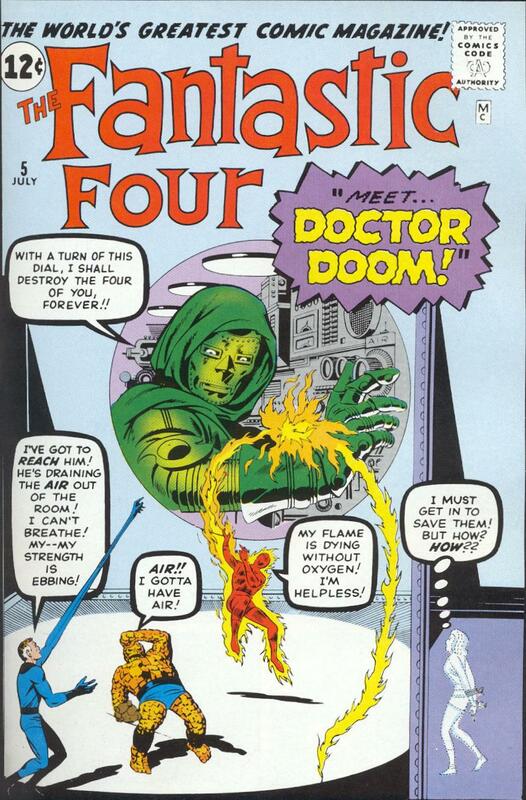 The origin of Doctor Doom was a little vague, though I’m sure they’ll delve more into that later. I also didn’t care for the fact that both Doom and Reid are former students that went to school with each other. Although I’ve always known about that connection of theirs, I just thought it felt a little weird, considering the fact that Doctor Doom seems so…inhuman. One thing I don’t want to forget: Johnny made a statement earlier – “The gems were scattered to the bottom of the sea during the storm!! What if Sub-Mariner should ever find them?” Oh crap! I hadn’t thought of that! I hope they bring that back up, and if so this would be the first instance of foreshadowing that ties storylines together. P.S. – the plot lines are getting more complicated, so my entries are getting longer.